Garlicky, soupy shellfish stews such as this one are found all around the Mediterranean coastline. Make sure you buy some crusty rustic-style bread to serve with it. Cut the chorizo in half lengthways, then slice into thin semicircles. Put the oil, chopped garlic and chilli into a large flameproof casserole or very large saucepan over a medium heat. As soon as the garlic sizzles, stir in the pimentón, cook for a few seconds, then add the chorizo and fry briefly until lightly coloured. Don’t let the garlic get too brown. Add the tomatoes, wine and 100ml water, then simmer for 10-15 minutes until reduced and thickened slightly. Meanwhile, put the sherry vinegar and sugar into a small saucepan, boil until reduced to 1 tsp, then stir it into the tomato sauce. Season lightly. Heat a griddle pan over a high heat. At the same time, tip the mussels into the tomato sauce, cover and cook for 3-4 minutes until they’ve all just opened. Uncover the pan briefly halfway through and give the mussels a good stir. Put the bread slices onto the hot griddle pan and toast them (in batches if necessary), pressing lightly with a fish slice, until golden and marked with the griddle bars. Rub one side of each toasted slice with the whole garlic clove. Warm 4 large soup plates, place 2 toasted slices on the side of each, garlic-side up, then drizzle with a little olive oil. Uncover the mussels and stir in most of the parsley. 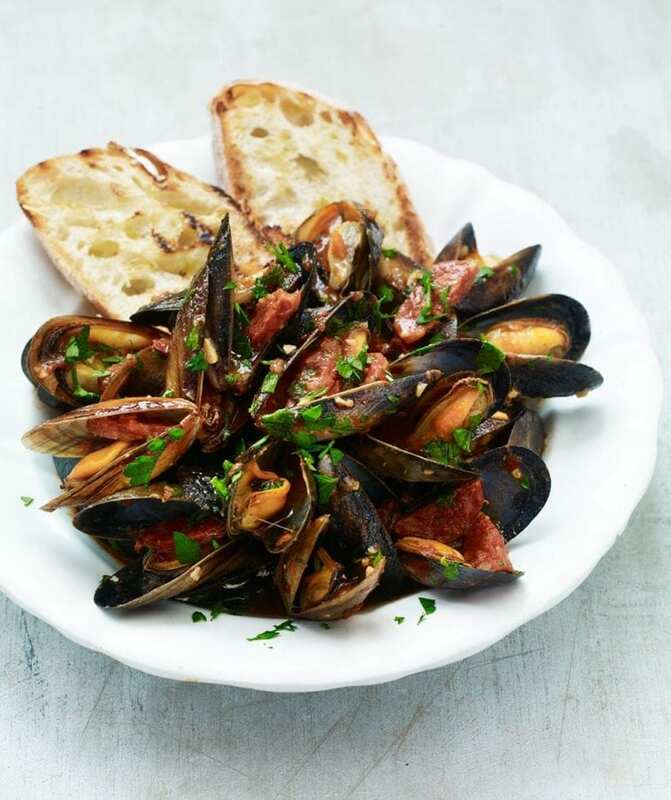 Spoon the mussels and plenty of sauce into the bowls, sprinkle with the remaining parsley and serve straightaway. Plump for a red wine here, but stick to a light, fruity style such as a young, inexpensive Spanish Tempranillo.